Our Passion Play procession now continues up Merseybank Road and stops in the green outside Hadfield Infant's school. Here is the setting for the trial against Pilate. 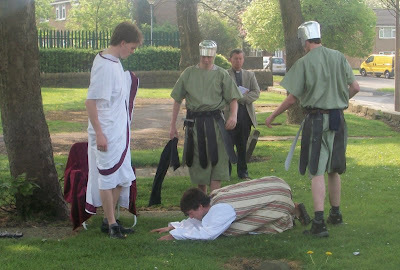 Jesus is dragged to see Pilate by the soldiers. A cornet solo announces Pilate. A very regal Pilate questions Jesus: "are you King of the Jews?". Pilate can find no evidence that Jesus is guilty of any crime so appeals to the crowds. He asks them if they want to free Jesus, as it is the custom for Roman officials to free a Jewish prisoner every Passover. But the crowd yell "Free Barabbas!" Pilate asks what they want him to do about Jesus. The crowd shouts "Crucify Him!" So Pilate orders Jesus's death. The soldiers drag Him off to be crucified. We sing "My song is Love unknown" (verses 2 and 3).